Guests of the luxurious Graylyn Estate can awake to find a complimentary gourmet breakfast buffet awaiting them in the Manor House Monday through Friday from 7:00 a.m. to 9:00 a.m., with hours extending to 10:00 a.m. on Saturday and Sundays. 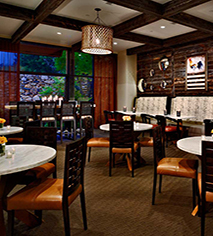 A deluxe continental breakfast is also offered in the Mews Dining Room during the same hours except with an offering of lighter fare. 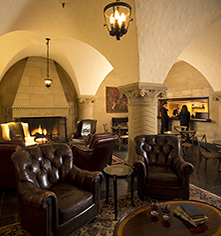 The Grille Room offers guests a casual dining experience and the opportunity to catch the game or unwind with a cocktail next to the cozy and ambient fireplace. A full bar is available from 6:00 p.m. to 2:00 a.m. every night and a light fare menu is available from 9:00 p.m.
An upscale, four-course culinary experience not to be missed. Dining rooms are decorated with furnishings and findings from another era and distant lands. 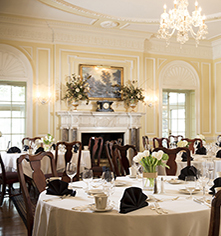 Graylyn Dining is available nightly by reservation from 6:00 p.m. to 9:00 p.m. in the Manor House. Guests wanting to stay in the room and treat themselves can do so with Graylyn's in-room dining service, conveniently offered from 11:00 a.m. to 9:00 p.m. daily.